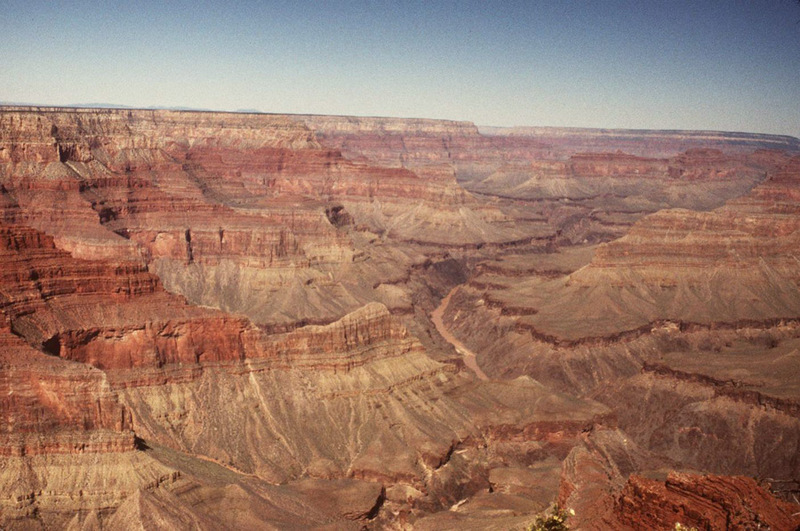 In September 1999, I was able to fulfill a longtime dream by visiting the Grand Canyon. I had several goals for this trip: first, I just wanted to see the legendary Grand Canyon of the Colorado River, the greatest natural wonder in North America and one of the greatest in the world. Second, I wanted to visit several other well-known attractions in the area: the Petrified Forest and Painted Desert, the San Francisco Volcano Field, and a couple of others. Third, I was specifically interested in seeing the geology of the Grand Canyon, because I'm an amateur geologist and the Grand Canyon is a mecca for geologists of all types. Geologists have a special liking for the Grand Canyon in part because it's an almost perfect natural laboratory for basic geology. Within the confines of Grand Canyon National Park, you can find examples of a wide variety of geologic phenomena: sedimentary strata, metamorphic strata, lava flows, granite intrusions, angled strata, disconformities, unconformities, fossils - they're all there. Whether you're an amateur who's never lifted a rock before, or a professional with fifty years of experience, the Grand Canyon speaks to you in terms you can understand and always, always offers the chance to learn something new. The whole Grand Canyon is an immense symbol of the depth and vastness of geologic time. Vista of the Grand Canyon looking roughly west, or down-canyon, from Mohave Point on the West Rim Drive, South Rim. Young-Earth Creationists are drawn to the Grand Canyon by that same vastness, and by their need to deny it. A Grand Canyon that is millions of years old is a clear refutation of young-Earth Creationism. So these creationists are forced to try to explain the Canyon in terms of their "Flood" geology: that the layers of rock were laid down by the Flood, and the Canyon itself was created during the run-off phase of the Flood. After I got home, and after I'd written a vacation report featuring my photographs from the trip, it occurred to me that those same photos could form the backbone of an article on the Canyon and which view of geology it supports, old Earth or young Earth. One of the great things about the Canyon's geology is that you don't need advanced training to understand it. All you need is eyes and a brain, and a few very basic principles. Thus this article. Is it possible that the young-Earth Creationists are right? That the Grand Canyon really is compatible with young-Earth Creationism? How was the Colorado Plateau formed? For both questions, the available evidence is the same: the rocks, fossils, and landforms of the Colorado Plateau and the Grand Canyon, and evidence derived from those sources, such as radiometric dates. Only the interpretation is different. My goal in this article is to explore both interpretations, that of creationist Flood geology and that of conventional geology, and try to determine which one gives a better explanation for all the available evidence. I won't be able to tell for sure which one is right this way, because there may be a third alternative I'm not considering, but I should be able to tell if one (or both) is definitely wrong. I've deliberately tried to keep this at as simple a level as possible, to show that anyone, whether they have any geologic training or not, can see and understand what the Grand Canyon has to show us. I also want to make it clear that I'm interested in one thing only: do the rocks themselves support the creationist theory? I'm not interested in attacking anyone's religion or their religious faith; I have known many very good people who were very strongly religious. However, when we're talking about science, then I believe religious faith shouldn't get involved. "Now faith is the assurance of things hoped for, the conviction of things not seen," says the Bible itself (Hebrews 11:1). But science is about what we can see. If the physical evidence fails to support the theory, then no written words will change that. Humans can be fallible, humans can be deceptive, but the rocks cannot lie. Nature is often complex, but never dishonest. The geologic record shows what actually happened, and there's no way around that. So, first we need to look at how the Colorado Plateau got there. Then we can look at how the Grand Canyon was cut into the Plateau. Then perhaps we can summarize what we know and reach some conclusions. Wolf photo in header from a public-domain US Park Service photo. All corporate logos and symbols are property of their respective owners, used under terms specified by their owners. All other content on this page is copyright Jonathon Woolf, unless otherwise noted. Please see my Site Policies page for more information on copyright and reproducing material from this site.